Are you eager to give your Instagram account a boost? A simple contest could be a super-effective tool for increasing your brand awareness and engagement on Instagram. 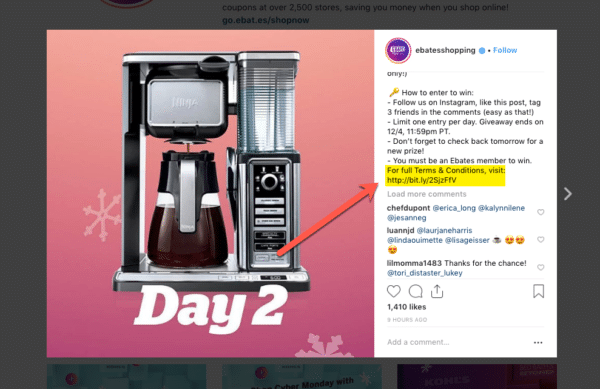 According to a study from Tailwind that analyzed over 60,000 Instagram posts, accounts that hold contests grow their follower base 70 percent more quickly than those that strictly opt for standard posts. Accounts that hold contests grow their follower base 70 percent more quickly than those that strictly opt for standard posts. It’s easy to see why: the barrier for entry is low and users love the combination of minimal effort and big prizes. Contests may be an effective social media marketing tactic, but they aren’t as straightforward as they appear. While it may seem tempting to post a last-minute contest with whatever prize and rules you think will draw followers, you could spark big trouble from both the social media platform and the government if you mess up. After all, despite their virtual nature, Instagram contests are governed by the same rules that apply to all corporate sweepstakes. Additionally, Instagram maintains its own set of rules. The good news? Instagram’s contest rules are easy to follow, especially when compared to other social media platforms. A statement from Instagram’s Promotion Guidelines regarding endorsement. Your contest should acknowledge that not only does Instagram not endorse the promotion, but the platform is also not responsible for anything that may happen to followers who participate in a particular contest. This is a key reason why your contest terms should be written as a legal contract between your business and any contest participants so that you are protected from litigation. 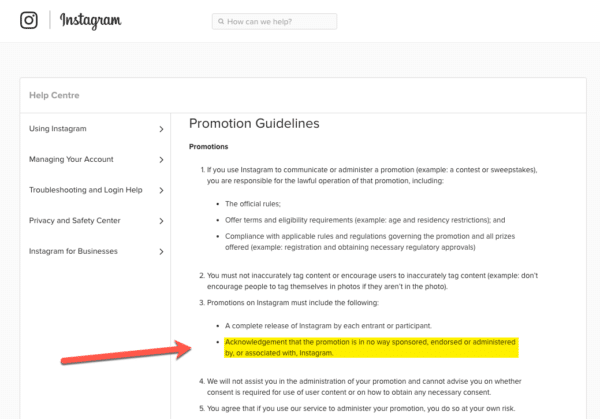 Likewise, contest-based posts must require participants to acknowledge that they abide by Instagram’s terms. 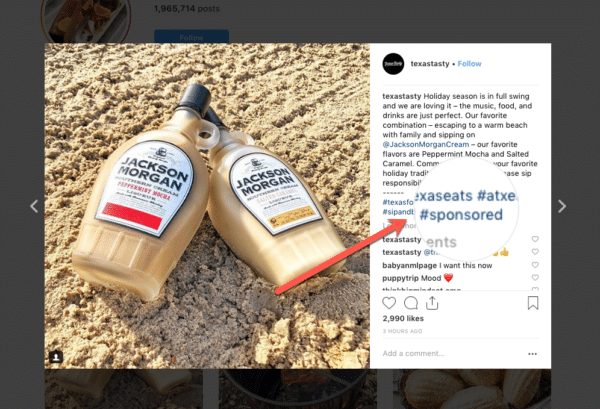 Many brands attempt to increase contest visibility and engagement by mandating that followers tag posts or images – even if followers aren’t featured in the highlighted photos. This tactic is in direct violation of Instagram’s rules, which prohibit inaccurate tagging. Instead of encouraging followers to incorrectly tag themselves, request that they use branded hashtags. Typically, contest participants denote their involvement through the use of a specifically designed hashtag. In the FAQ included in its Endorsement Guidelines, the Federal Trade Commission (FTC) strongly recommends that all promotions clearly designate their status in hashtags by including either the term ‘contest’ or ‘sweepstakes.’ According to the FTC, even a hashtag that includes ‘sweeps’ is not specific enough, as people might not automatically recognize that the term refers to a contest. An Instagram post highlighing the correct use of contest hashtags. Depending on the value of the prize, it may be necessary to take extra action with the IRS (if of course, your contest is hosted in the USA). Prizes valued at over $600 reach the minimum threshold required for IRS Form W-9, which winners must be willing to complete. Additionally, those who win prizes valued at over $600 must be willing to provide their Social Security Number. Contest participants should be informed of the potential for reporting to the IRS in advance. They should also be alerted to the deadline for completing necessary documentation. Brand sponsorship or influencer promotion can dramatically increase contest visibility, while also reducing overhead costs for the promotion. However, when sponsors get involved, additional rules and protocol come into play. Sponsors and influencers should always be tagged and clearly identified in all contest-related posts. An Instagram post using a hashtag to show that it has been sponsored. Contest rules vary considerably not only from one nation to the next but also between states. A contest that is perfectly acceptable in, say, Virginia, may look radically different than what abides by legislation in New York. Some states require registration of all prizes over a certain monetary value (typically $5,000, although Rhode Island sets a limit of just $500). In Florida, prize registration must occur at least one week before the contest begins; in California, registration is required a full month in advance. In Virginia, contest eligibility cannot be determined based on whether users have visited a brand’s physical location. In other words, in-store contests (in which followers visit a physical location, take a picture, and tag it) are out of the question in Virginia. Some states prohibit purchase requirements as part of social media sweepstakes. In Vermont, for example, purchase requirements are banned, even if winner selection depends on demonstrating a specific skill. Many states have been known to crack down on businesses that incorrectly implement Instagram contests. When in doubt, check with your state to ensure you follow all local rules. Technically, website-based lists of contest rules are not required – but they are advisable, as they can increase your likelihood of following through with required notifications and clarifications. An Instagram post providing a link to full contest Terms and Conditions. 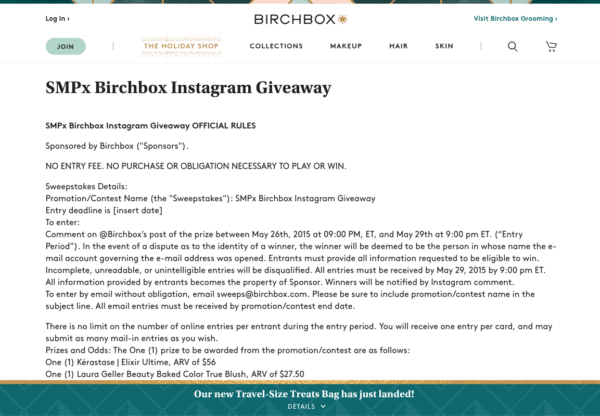 As another example, Birchbox frequently hosts Instagram sweepstakes, with each contest post linking to the website’s official rules page. An example of contest Terms on a website. Basically, they wipe their hands clean of any obligation or support to the outcomes (both positive and negative) of your contests. So you need to be legally in-the-know before running a contest on Instagram. With so many brands breaking even the most basic contest rules on Instagram, it stands to reason – Why put so much effort into compliance? Trust us; it’s important to play ball, even if it feels like a hassle. The risks of breaking the rules could be far more significant than you suspect; not only could you face penalization (or even page suspension) from Instagram, you may run into trouble with the FTC or the IRS. A little due diligence is more than worth your while.